"Nothing beats the chime and versatility of Vox amplifiers. From country to rock they have me covered perfectly. Mix all of that in with an amazing pedal range you can see why they have stood the test of time. I love Vox amps." An enthralling voice well beyond his years, at just 26 years old, Andrew Thomson's voice and talents have been compared to those of industry veterans. 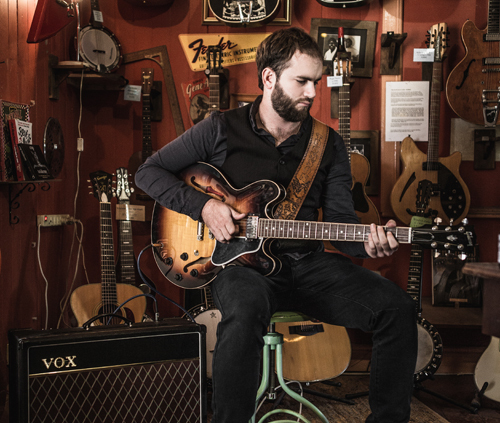 Drawing inspiration from Chris Stapleton, John Mayer, The Steel Drivers and John Bulter, Thomson's style is crafted in the realms of bluegrass and alternative country. Thomson has spent the last few years playing around his hometown region of Gladstone, honing his craft and adding a few more instruments to his repertoire, banjo and dobro, already playing acoustic and electric guitars, mandolin and slide guitar. Andrew was inspired to play country music after listening to Graeme Connors growing up and since then has gone on to win a slew of accolades, including second place in Touchwood Productions' Discover quest for Australia's best country songwriter and a male vocal finalist at the Capital Country Music Association's National Talent Quest (2012). After winning a state wide competition in 2009 with a demo of six original songs, Thomson was selected to open the Gympie Muster on the Main Stage. Since then he has featured in the line-up of many festivals around Queensland including, El Grande, Agnes Blues and Roots Festival and Tamworth Country Music Festival. He has also opened shows and gotten huge crowds moving for Ash Grunwald, Bennett, Bowtell & Urqhart, Catherine Britt, Graeme Connors and Adam Harvey. During the Tamworth Country Music Festival 2016 Andrew shared the massive Toyota Park Stage with the Deep Creek Road, Aleyce Simmonds and Paul Cowderoy. He rang in 2016 playing to a crowd 4000 strong in Airlie Beach and then heading to Tamworth to attend the Country Music Festival and graduate from the CMAA Academy of Country Music. This year brings a new chapter of his career, re-locating to Tamworth and playing a variety of venues and cities around Queensland's south east. Thomson is bringing his own special blend of Alt-Country, Bluegrass and Americana to Australia's Country scene with his debut EP out later this year, recorded with award winning producer Matt Fell at Love Hz Studios in Sydney.